Luo Han Guo is one of the most exciting new sweeteners to emerge in the last few years. The plant is native to the Guangxi province in southwestern China. Luo Han means monk and Guo means fruit, and it has become known as Monk Fruit in the west. Although it is beginning to create a stir because it is a natural zero calorie sweetener, it has been know in China for about 800 years. It was also used for medicinal purposes. In addition it contains important antioxidants. The sweetness comes from mogrosides which make up approx 1% of the fruit by weight and which are about 300 times as sweet as sugar. It has a zero glycemic index, contains no calories and is suitable for diabetics. It is a natural product. It is only recently that methods have been used to extract the mogrosides in pure quantities. This enables the sweetness to be concentrated without undesirable flavours. A firm called BioVittoria has begun to cultivate it and grow it commercially in New Zealand. It is used as a natural zero calorie sweetener. Because it is about 300 times sweeter than sugar it needs to be mixed with a bulking agent if used as a table top sweetener. Otherwise it would be impossible to measure out the required quantity. It is heat stable, with a long shelf life, and is suitable for cooking and baking. 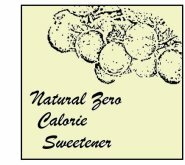 It also mixes well with other low calorie sweeteners such as stevia and erythritol, producing a synergistic effect and masking unwanted aftertaste. On it's own it has a good clean taste, better than Stevia, and without the bitter aftertaste. However some people report a slightly off taste. Nevertheless, unlike Stevia, it is being used in some products to provide 100% of the sweetness. One reason Monk Fruit has not yet gained wide usage is because it has a cost factor double that of Stevia. In addition it has not yet gained approval in Europe. Zero glycemic index. Zero calories. Does not contribute to tooth decay. May have useful medicinal properties. It may have a role to play in weight control and regulation of blood sugar. Diabetics would be well advised to see what effect the inclusion of this sweetener makes in their diet. No known concerns. Has been consumed in China for hundreds of years. Although it has not yet been approved in the EU it has been granted GRAS status in the US. No upper ADI (Acceptable Daily Intake) has been set as it is considered very safe. Testing has been carried out on rodents and dogs at high levels with no adverse reactions whatsoever. This is all good news, even better than Stevia, and would give a lot of confidence regarding the use of this product. This is probably down to lack of thorough testing. Hopefully the rating may be upgraded in the future. It is produced in a totally natural way. The fruit is crushed and water used to extract the juice. This is filtered to obtain the mogroside v which gives the product its sweetness. It is sold in liquid and powdered form. The powdered form is preferable, as some of the liquids may contain other sweeteners, and these may not be naturally produced. Neway Natural sell a product called Sweet Sensation. Nectresse from the makers of Splenda is bulked up with Erythritol. A new product called 'Monk fruit in the Raw' is bulked up with dextrose. In Japan a very popular sweetener called Lakanto has been sold for years. It is available on Amazon. It is the most expensive intense sweetener. Nevertheless, on the commodity market it still cheaper than sugar, costing about 72% the price for the same unit of sweetness. In 2012 it sold approx 0.1 million tonnes equivalent out of a total world market of approx 188 million tonnes. (Sugar was about 155 million tonnes) This would give it about 0.05% of the total market by unit of sweetness. By value it would be slightly less. The local in the Guangxi province in southwestern China attribute their longevity to the consumption and medicinal use of Luo Han Guo. It has been used for many years in the treatment of sore throats, coughs and for fevers. In the USA the Food and Drug Administration has granted it GRAS approval. (Generally recognized as safe). Approval has not yet been granted in the EU. Hopefully this will occur soon. Luo Han Guo is an excellent and exciting new zero calorie sweetener. It is a natural product and appears to be totally safe. Is useful for diabetics and it is harmless to teeth. Not yet widely available, but this should improve. Can be used in cooking. It's more expensive than Stevia, but has a more acceptable taste. Hopefully costs will come down enabling Monk Fruit to displace excessive sugar or artificial sweetener consumption in people's diets.